Midlife and retirement are two natural but different crossroads, typically, but not always, related. While I basically knew this prior to the 16-month research I did for the writing of my forthcoming book Quest for Contentment, I discovered new elements of it, and at greater depth. It was affirmed, again, for example, that the quality of my maturing experience of retirement is directly related to the preparatory psycho-emotional spiritual work I did earlier in midlife. Also, that each path raised to consciousness different aspects of related issues that are foundationally important to me. 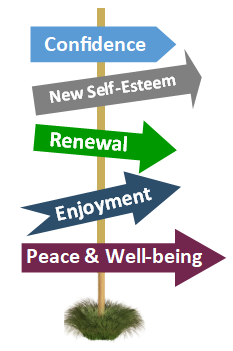 Each of us has our own matrix of midlife issues that are the product of our own life journey. Dealing with these “whispers” as they arise provides a new stronger and more congenial base to deal with deeper higher-order issues that often unfold in retirement. Earlier I shared some thoughts about retirement issues. In this post I focus on the later life journey that begins with evolving midlife awareness. Middle age and midlife are not synonymous terms. The first is a reasonably predictable statistic as the mid-point of our average life expectancy. The second is developmental, therefore less precise. It refers to that time when we begin to think differently about our life—to date, and going forward. Typically, we become aware of unrealized expectations, and recognition of time’s passing; which sometimes generates some degree of anxiety. Generally middle age precedes midlife, though they may occur close together; especially when one is faced with involuntary retirement. Similarly, retirement is also related but not equivalent to midlife, and typically follows it. Experience affirms that people who consciously engage their evolving midlife whispers, thoughts, or fears typically have a much better experience of retirement. What we aim to do in our retreats, workshops, and private coaching is to help mid-lifers progress well through their own midlife passage, and lay the foundation for a rich and satisfying retirement. Recognizing, as they do, the different ways their own “best-ness” will evolve and become better as they actively and consciously deal with their surfacing midlife issues which, at base, contribute to unfolding maturity. Relatedly, to help them discover meaningful options at their own unique crossroads, and choose their own unique path to unfolding contentment: Which is ultimately contentment with their self, and their life as it is. Another learning from my research and writing reflection was the realization that most of the turmoil I experienced in my own transition from midlife to retirement was based on outdated thinking. I.e., was self-generated and self-sustained by immature beliefs I tenaciously held though had outgrown. Also, that I was able to reduce my turmoil and replace it with increasing contentment by consciously letting go of those that no longer fit. Also, by engaging some aspects of my life history I had long avoided or didn’t recognize as still-festering issues. Particularly left-over unresolved issues from my family of origin, as the multi-disciplinary literature widely affirms. You can get a sense of my how my journey and experience relate to yours by reading short descriptions of our retreat and workshop program listed on the first section of the survey posted on this website. If you are kind enough to complete that survey, which only takes a few minutes, you will help us decide which topics to prioritize, because they are important to you now. If you do that we will give you a $20 coupon for one of our retreats or workshops; plus, a $30 coupon redeemable for private coaching related to your private questions or needs, and personal quest for late-life contentment. This $30 coupon is in addition to the free no obligation 30-minute consultation we offer people considering private coaching to help them deal with their personal history and issues. Click here to request an appointment. You are free to use that $20 coupon at our upcoming retreat on November 17 at Ignatius Retreat Centre where we will discuss 8 keys to Fulfillment in Life’s 2nd Half.